Cutting through all of the hype around autonomous trucks, the latest development from DB Schenker and its technology partner Einride, is an interesting step forward in automation for on-site materials handling and warehousing. Schenker has started what appears to be an advanced pilot project, utilising a robot tractor vehicle for pallet movements and cross-docking activities at its transhipment facility in Jönköping in Sweden. The vehicle is described by Schenker as travelling “continuously to and from a warehouse” and this appears to entail moving on public roads, although the size, location and volume of traffic on these roads is not made clear. The vehicle is called a ‘T-Pod’ and has both autonomous guidance systems and an option for remote-control. The vehicle is electrically powered with a range claimed to be 200km on one charge. The T-Pod can carry 15 euro-pallets. 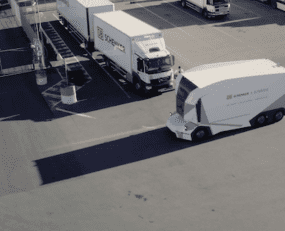 Ironically in the video released by Schenker and Einride, the ‘T-Pod’ electric vehicle arrives at the cross-dock and then the pallets it is carrying are unloaded by a man with a pallet truck. The logical extension of the ‘T-Pod’ technology is greater automation within the transhipment depot itself, this certainly being a less hostile environment than the public road. This might suggest the unloading process could be automated more easily than road movements. Although the press release from Schenker and Einride talks about this pilot project as a move towards autonomous trucks, it does appear that the T-Pod is some way from being capable of being a viable ‘on-the-road’ commercial vehicle for long-distance movements of cargo. However, this should not distract form the potential of such vehicles for the management of large logistics facilities. Automating movement as well storage operations is now a real option leading to a dramatic reduction in requirement for labour but also an increase in the speed and precision of handling containers, trailers and even items as small as tote boxes. Whilst this may well be a threat to the jobs of those working in on-site operations such as warehouses and cross-docks, the technology offered by T-Pod and others is still some way from offering even a reduction in the need for truck drivers. Meanwhile the shortage of drivers is now becoming a constraint for the growth of road freight. It would appear logical to suggest that the task that the logistics sector faces is shifting workers away from on-site operations and towards truck-driving. However, to do this the logistics sector may have to share benefits of lower costs that automation offers with its employees through higher wages and better conditions in return for becoming drivers.